Susan Bock counsels clients in the administration of estates and trusts, as well as estate, corporate, tax and financial planning. Susan’s practice includes advising clients in the areas of income, estate, and gift taxes; counseling trustees and beneficiaries; charitable planning; and working with families and closely held businesses to achieve business succession planning and the creation of small family businesses. Susan also represents tax exempt organizations. She has successfully represented numerous clients before the IRS and U.S. Tax Court regarding valuation of closely held business interests. Susan’s service to her community both professionally and personally is extensive. Besides her board position with the Oregon Recovery High School Initiative. 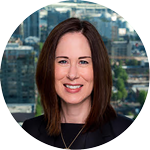 She is a member of the Oregon Bar Association, and on the Editorial Board, Estate Planning & Administration Section of the Oregon Bar Newsletter. She is involved in Bryn Mawr Club of Portland, Lake Oswego Equestrian Center, Portland Duke Alumni Association, Legal Aid Services of Oregon Elder Law Clinic, and Catholic Charities.